This Nittan Evolution manual call point is a resettable IP24 rated MCP suitable for indoor applications. The unit is DIP switch addressed and supplied complete with both a surface mounting back box and flush mounting wall plate. This call point is also available with an optional short circuit isoltor. Resettable manual call point for Nittan Evolution protocol. IP24 rated housing, suitable for indoor applications. 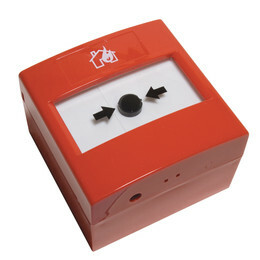 Supplied with both surface backbox and flush mounting wall plate. Available with optional short circuit isolator. Relative Humidity : ≤ RH95% non-condensing. Addressing Method : 8 Way DIL switch.